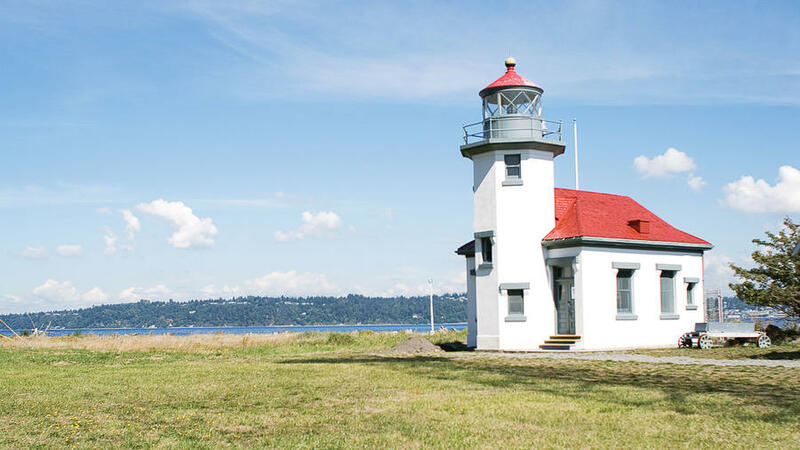 Point Robinson Lighthouse, and its still-flashing light, has stood watch over Puget Sound since 1915. Part of the allure of Vashon Island is that it’s not overrun with day-trippers. (And don’t worry: We’re not advocating that it should be.) But as long as you respectfully convert to Island Time, locals welcome you to explore its sandy beaches, woodsy trails, and galleries. A popular bumper sticker proclaims KEEP VASHON WEIRD, revealing the heart of this artistic community, just a shout from Seattle. ($4.30 round-trip to walk on, $1 bicycle surcharge; from $18.50 round-trip to drive on; 206/464-6400) run frequently from the Fauntleroy Terminal in West Seattle. If you drive, consider renting some wheels at Vashon Island Bicycles (closed Mon; $20 per day; 206/463-6225). Visit for more info. Pack your pannier with just-picked greens, island cheese, and local wine. INFO: 10-2 Sat year-round, 2-5 Wed Jul 16-Oct 15; Vashon Hwy. S.W. at Bank Rd. S.W. ; 206/267-8146. Point Robinson Park For beach walks and Mt. Rainier photo ops, bike 6 miles south of town to the eastern tip of Maury Island – attached to Vashon by a narrow road. INFO: Free lighthouse tours 12-4 Sun through late Sep and by appointment (206/463-6672); rent the Keepers’ Quarters from $1,050 per week; 3705 S.W. Point Robinson Rd. ; or 206/463-9602. Vashon Island Coffee Roasterie Rare Heirloom Coffee, slow-pressed. INFO: 19529 Vashon Hwy. S.W. ; 206/463-9800. Gusto Girls Toast summer evenings with spicy ginger martinis on the patio. INFO: $$; 17629 Vashon Hwy. S.W. ; 206/463-6626. The Monkey Tree Locals’ fave for its bread-zucchini gnocchi and raspberry-rosemary iced tea. INFO: $; closed Wed; 17817 Vashon Hwy. S.W. ; 206/463-4635. Heron’s Nest Pottery, jewelry, and fabric art from many of the 300-plus artists who live on Vashon and Maury Islands (more info at ). Closed Mon; 17600 Vashon Hwy. S.W. ; 206/463-5252. Kronos “Where did you get that?” gifts. 17610 Vashon Hwy. S.W. ; 206/463-0061. Giraffe Bright orange house packed with fair-trade food and recycled fashions like telephone-wire bangles. 9905 S.W. 174th St.; 206/463-1372. Make your kids’ night and sleep in a tipi or covered wagon at Vashon’s (from $20; 206/463-2592). Birding with expert Ed Swan (tours by appointment; $35 per hour; 206/463-7976). Hit the Vashon Island Strawberry Festival (Jul 12-13; 206/463-6217) for parades, crafts, sno-cones, and, of course, sweet berries.